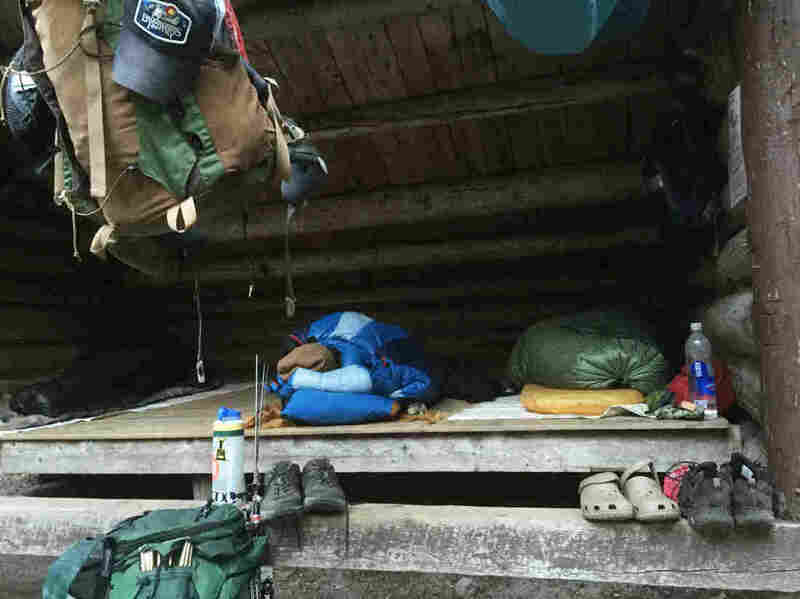 On The Appalachian Trail, Combat Veterans Learn To Let Things Go The first American ever to walk the Appalachian Trail in one season was a World War II vet, who said he wanted to walk off the war. Now, a nonprofit sponsors combat veterans to do the same thing. 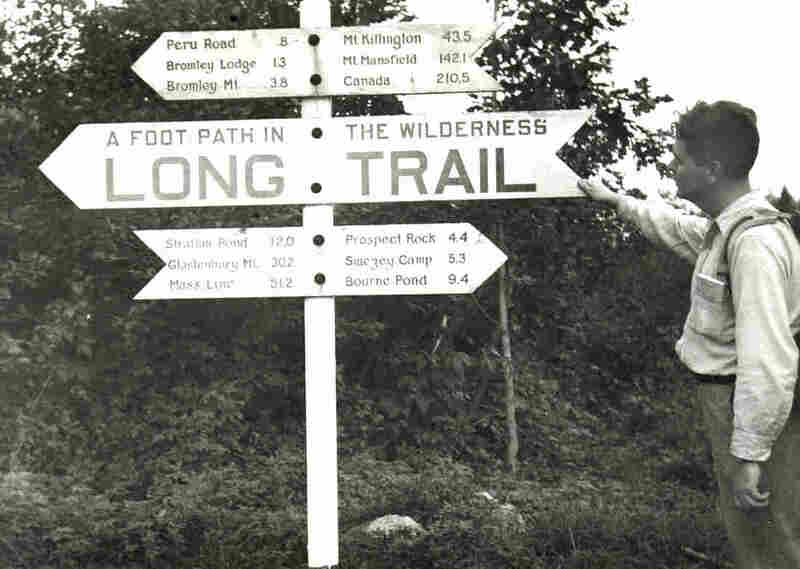 World War II veteran Earl Shaffer is believed to be the first American to walk the Appalachian Trail in one season, and his diary details the 124-day south-to-north trek. Back in 1948 Shaffer said he wanted to "walk the Army out of his system." Some newer war veterans have the same idea, and NPR tagged along as they finished the 2,100-mile trek. 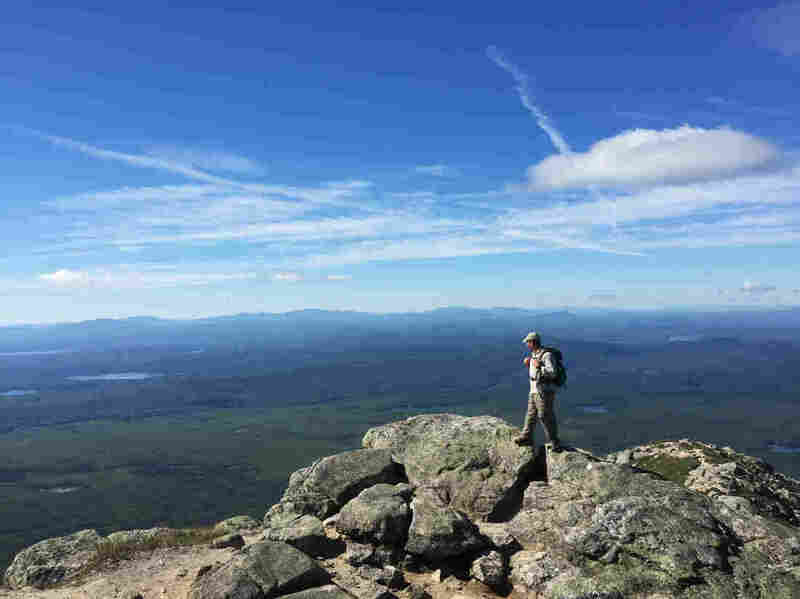 Marine Corps veteran Sean Gobin stands at the edge of the plateau on Mount Katahdin in Maine. 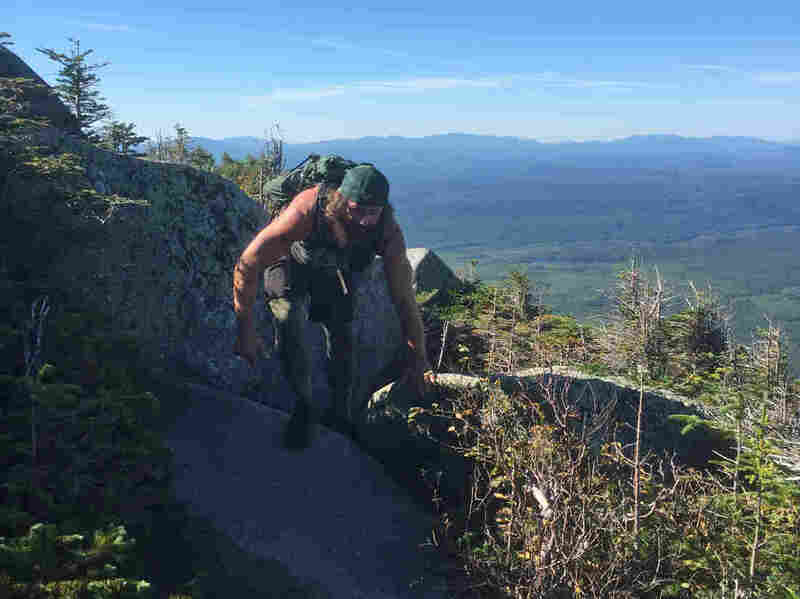 After three combat deployments he decided to hike the 2,100-mile Appalachian Trail as a way to transition to civilian life. 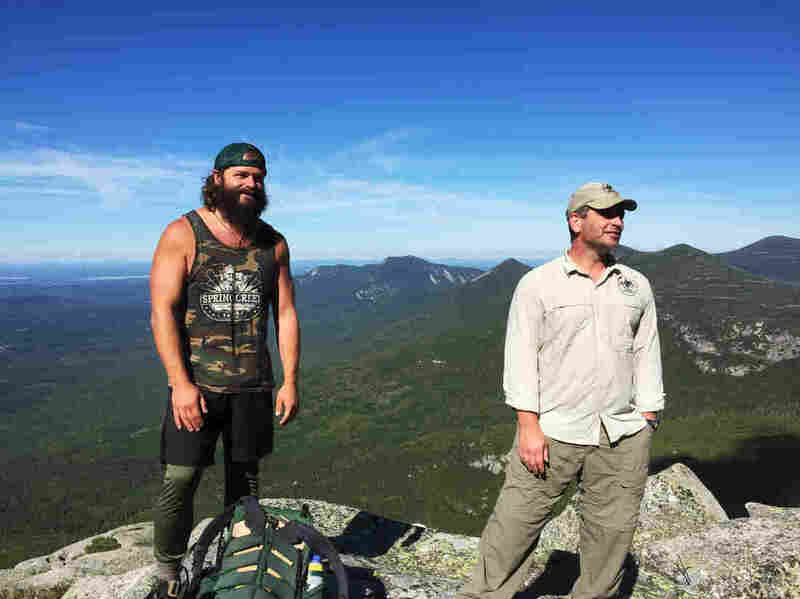 The healing effects of the six-month journey inspired him to start a nonprofit, Warrior Expeditions, which sends vets on long distance wilderness trips across the country. A few of the hikers sleep-in past dawn at the base of Mount Katahdin, where the trail ends. "My deployments were tough, but this is tough on so many other levels," says Marine Corps veteran Daniel Dean, shown here curled up in his blue sleeping bag. "Especially in you don't have to do it. If you walked away at any point, there's gonna be no repercussion except for on yourself." Dean climbs over a pink granite boulder on his way up Mount Katahdin. The trail stretches from Georgia to Maine, and usually takes about six months to complete. (Left) Cody Yates did 20 years in the U.S. Army and Marine Corps. 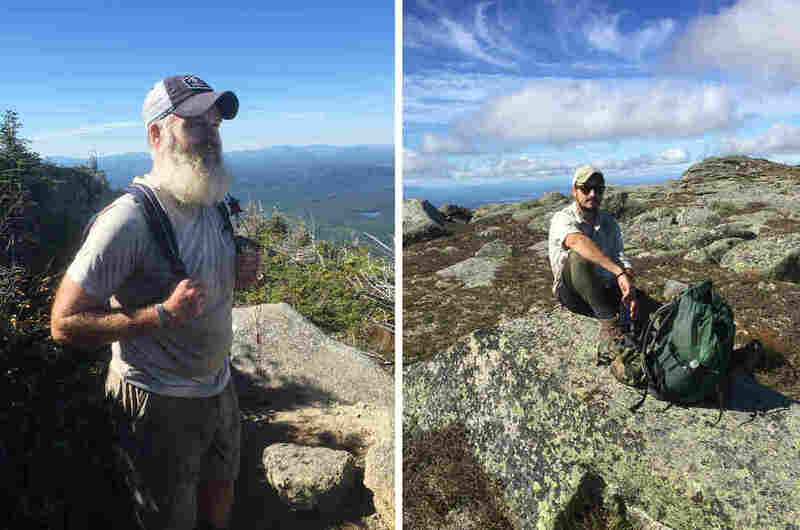 Before he was even formally retired this spring he started hiking the Appalachian Trail, and he says the trip has made a gradual re-entry to civilian life. "I've had a few friends who've died over in Afghanistan. You'll never completely get over that," Yates says. "You'll be hiking along and all of a sudden your mind just goes off ... whether you want to or not, your mind says, OK, we're going to work through that issue." (Right) Joshua Bridger deployed twice to Iraq and wants the outdoors to be a big part of his life going forward. "My body's tired, but my mind is already thinking about the next adventure," he says. Dean (left) and Gobin hike up the last few miles of the trail on Mount Katahdin in Maine. The Warrior Hikers are supported by veterans organizations. "Meeting all of these other veterans and communities along the way that opened up their homes to us during the hike, that framed my thinking that not all people are bad, and I don't have to isolate myself," Gobin says. 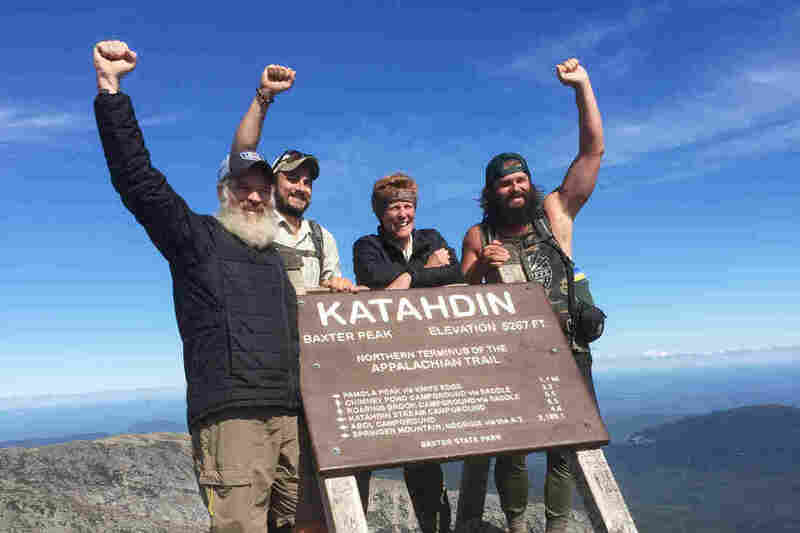 (From left) Combat veterans Cody Yates, Joshua Bridger, Diana Brown and Daniel Dean at the end of the Appalachian trail, six months after they set out from Springer Mountain in Georgia. Brown, who did four combat deployments with the Air National Guard, says the trail helped her realize what was important and what heavy things she should just stop carrying around. "I just had to let them go," she says. "You know there's no fixing it. You don't have to carry 'em. Let 'em go."